While studying abroad in Spain, I (Kara) embarked on many adventures outside of the country. Not only was it an escape from the paper writing and lecturing, but also a reason to explore the incredibly diverse food and cultures of neighboring regions. For a long weekend in chilly November, I boarded a plane with my roommate to Lisbon. To explore the city, we forgoed the tram and went by foot. 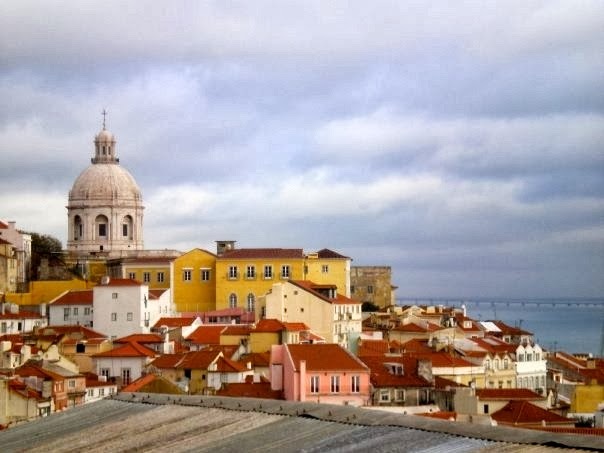 In Lisbon, I remember meandering through the black and white swirling tile roads as we made our way to the Rio Tejo docks along the Atlantic Ocean. While we wandered through the backstreets, we came across custard-filled pastries at bakeries, eateries with an array of sautéed squid with garlic and lemon juice, grilled whole shrimp with hot piri-piri sauce, and the best roast chicken with spicy red pepper infused oil. The absolute highlight of Portuguese cuisine was the mastery of savory, hearty soups and after winding through the chilly city, a steaming bowl was in order. With the chill of fall upon us, I thought it was appropriate to make one of Portugal’s most beloved soups, Caldo Verde. Meaning “green soup”, the fusion of light, curly strands of kale and hearty chorizo prove to be perfect complements. In a dutch oven, heat the EVOO over medium-high. Add the chorizo and cook until browned. Remove the chorizo to a paper-towel lined plate, and add the onions to the pot. Lower the heat to medium and saute the onions until translucent, about 5 minutes. Add the garlic and cook an additional minute or two. Add the potatoes and stir for an additional minute. Sprinkle with cheese and serve with a big hunk of rustic bread. This simple, savory soup is a great alternative to a stew or chili!